Tired eyelids create a feeling of tight skin which, in turn, leads to an itching or burning sensation in the area. Tiredness in the eyelid area chiefly affects contact lens wearers, people who spend a long time in dry or polluted environments and people who have not had enough sleep. The main function of the eyelid is to protect the eye. This area is very sensitive to adverse conditions and is prone to dehydration. A dehydrated eyelid leads to an irritating sense of tightness and tiredness in the area. 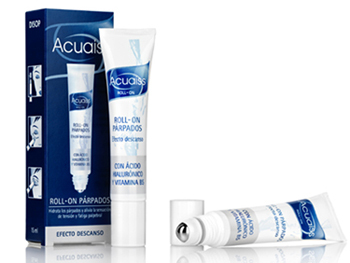 Acuaiss roll-on with hyaluronic acid and dexpanthenol is a refreshing gel that moisturises and repairs the skin around the eyelids. Its formula has a oily-free, gel-like texture. It contains hyaluronic acid and Vitamin B5 (Dexpanthenol) to moisturise the skin and alleviate the sensation of tightness around the eyelids. Hyaluronic acid helps to maintain the water balance in the structure of the skin in the eyelid area and helps bind the water molecules to the eyelid tissue. Vitamin B5 (Dexpanthenol) is related to processes involved in cell regeneration. It also helps to diminish the symptoms of inflammation in the eyelids and increases the sensation of comfort. The effects of Acuaiss roll-on are also achieved thanks to the roll-on system of application. Use circular movements to lightly massage the whole eyelid area. We recommend this product be used every day and it can be applied as often as necessary.